Palheiro Pro Tips - Philip Talbot the Director of Golf points the way to a better round. All descriptions are relative to the Gold tees and yardages are in metres. Hole 1. 342 A hole that plays a little longer than anticipated due to the incline of the fairway and raised green. A long hitter should think about a 3 wood off the tee aimed directly at the fairway bunkers. Club up for your second. Hole 2. 316 A shortish par 4 which will present a good chance for a par if you find the fairway from the tee. The short iron approach should favour the left side of the green. Hole 3. 179 The first of five excellent par 3 holes at Palheiro. Concentrate on the shot and not the elevated view down into the capital City Funchal. If you find the green a fiendish putt awaits you. Hole 4. 305 A blind tee shot that must favour the right hand side of the fairway. The green is well guarded by bunkers and set below the level of the player. The famous Casa Velha Hotel sits just beyond the green. Hole 5. 141 Another favourite. A downhill tee shot entices the player to hit a good one. A narrow green which can be fast and breaking. Hole 6. 520 After taking refreshment at the Tea House you will be ready to attack this long par 5. Only reachable by the very long hitter who can cut the dog leg off the tee. If not play the hole as a good 3 shotter. Hole 7. 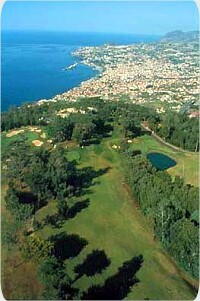 190 An attractive longer par 3 that plays alongside the famous Florialis flower factory. Wind is always a factor here and can play anything from an 8 iron to a 4 or 5. Hole 8. 344 A medium length par 4 but again with the second shot played uphill take plenty of club with the approach. A steep bank at the back of the green will work to your advantage. Hole 9. 365 A super right to left dog leg that requires a gentle draw from the tee. If you can do it a medium to short iron approach could set up a birdie opportunity. Hole 10. 468 The back nine starts in earnest straight away with this simple looking par 5. But beware you slicers; anything right off the tee trees will block your line to the green. A long, narrow green is a fine feature on this hole. Hole 11. 159 Another good middle iron, downhill par 3. The key here is club selection. Anything long will virtually guarantee a bogey or even worse. Study the wind direction from the tee and remember the hole is played downhill. Hole 12. 529 A monster par 5 that is realistically out of reach for anyone. Played uphill all the way just keep going until you get to the green. Then the fun starts on this highly undulating piece of ground. Hole 13. 129 Probably the most scenic and photographed hole at Palheiro. But it’s also a good one. Attack the left hand pin position at your peril. Short, the lateral hazard awaits. Get it right and you will leave the green with a beaming smile. Hole 14. 406 A fine dog leg left to right this time. The medium to long iron approach must be struck true with height to stop on the green. Favour the right side for your approach shot. A sympathetic bank may help your ball find the target. Hole 15. 478 After fading your tee shot at hole 14 you really could do with your draw here. Do not attempt to cut the corner off the tee the giant pines will gather the ball. The feature here is the lone tree that sits directly in front of the green. Beware! Hole 16. 325 Another short but deceptive par 4. Play a lofted wood or long iron from the tee. Distance is not required but accuracy. From there club up as the green sits well above you. The green is often very fast from back to front. Hole 17. 403 A potential card wrecker. The toughest par 4 on the course. Length and accuracy is required here as the hole is often played into the wind. Good luck! Hole 18. 487 After the rigours of the previous hole the last at Palheiro is a classic “sporty” par 5 that can often give up a birdie. The tee shot requires a gentle fade and once you climb the hill and the green comes into view you will soon forget our bad shots as you look out over the Atlantic Ocean! What a way to finish.